Squeegee Cleaning Service employees had a job to do at Children’s of Alabama this week, but Superman, Batman, Spiderman, and Captain America came to work in their place. According to Fox6 News, Children’s of Alabama partnered with the cleaning service as part of their “Celebrating Our Superheroes” week from September 16-20. 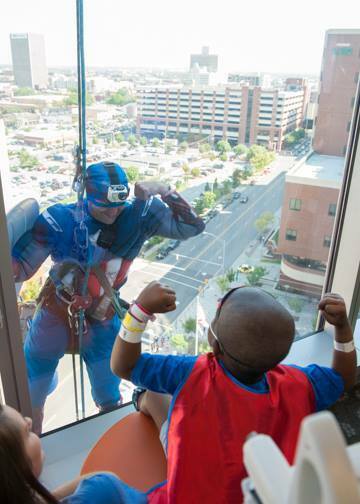 Other hospitals have had superheroes visit them before, but Children’s particularly wanted to honor Childhood Cancer and Sickle Cell Awareness Month -- and to celebrate the heroic strength of their young patients. The smiling heroes in bright, iconic uniforms scaled the 12-story building while waving and interacting with the excited kids along the way. The children, celebrating their own inner strength, greeted the characters at the windows also dressed in hero attire, capes and all. We couldn’t agree more. But even an amazing staff, incredible parents and the strongest of kids could always use a friendly-neighborhood window-washing superhero to brighten up their day.